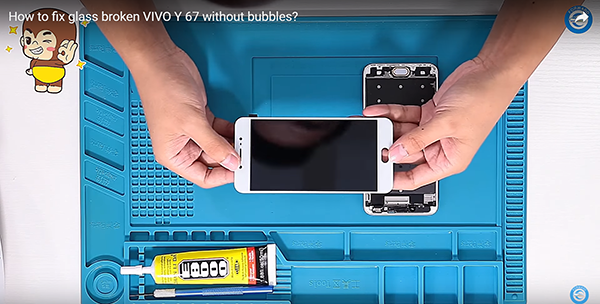 How to fix glass broken VIVO Y67 without bubbles? As we know, more and more people start to use vivo phone.Because now it's popular. so more and more repair shop use this model to laminate. RMB machine not only can laminate edge LCD, it also can laminate all kinds of LCD. First, we need to test the LCD. Because this model , the touch and LCD is not together.the display works well, now let's do it.We need to take out the protector. Then we send the LCD into the machine. Choose the laminating pattern and start it. We need to wait, because this machine can automatically change the pressure.it's very convenient. when you laminate, two things are important, one thing is vacuum, another thing is balance. with two functions, your LCD after laminating will be less bubble. So we not only sale machines, we also provide training.we will give you video training. or you can go to our factory, we can provide trianing face to face. When the vacuum down to zero, we can open the door. And take out the LCD, we can check here.nearly no have bubble.and with this machine , we no need to release the flex cable. The flex will not to broken the LCD for this situation. it will be very convenient for the repairment. Now we put it into the machine to do the bubble remover. And then we choose OCA bubble remover pattern.only 2 mins is ok.no need to waste time. ﻿And also we now,this machine is 5 in one machine. No need the vacuum pump, no need air compressor, and also no need the put OCA machine.it including laminating and bubble remover together. This machine for repair shop is all the way very convenient.Because no need big place. Small machine can use for all situations.all model can repair. If you set 2 minutes, it will show you how many time gone, and how many time last. You will know it when the time reach.when you check the vacuum down to zero, you can open the door.for this door. It's very safe.because all with the iron. We open the door and take out the LCD and check.